Medium Brown coloured Acacia Bathroom Parquet Flooring In the Navylam+ Flooring, that has a Oiled Finish with a Natural Surface and is 9mm Thick and 68mm Wide. Certain exotic wood species have natural moisture repellant genes and Acacia Navylam+ is a unique wood floor parquet system for use in your bathroom or wet areas and is easy and fast to install. Each strip is pre-oiled with a double integrated joint and is pre-sanded with initial oiling, you just apply Navylam Water Tight Sealant* in to the integrated tongue and groove joints of each parquet strip then apply the Navylam Top Oil* so your parquet floor is completely watertight and looking unique. 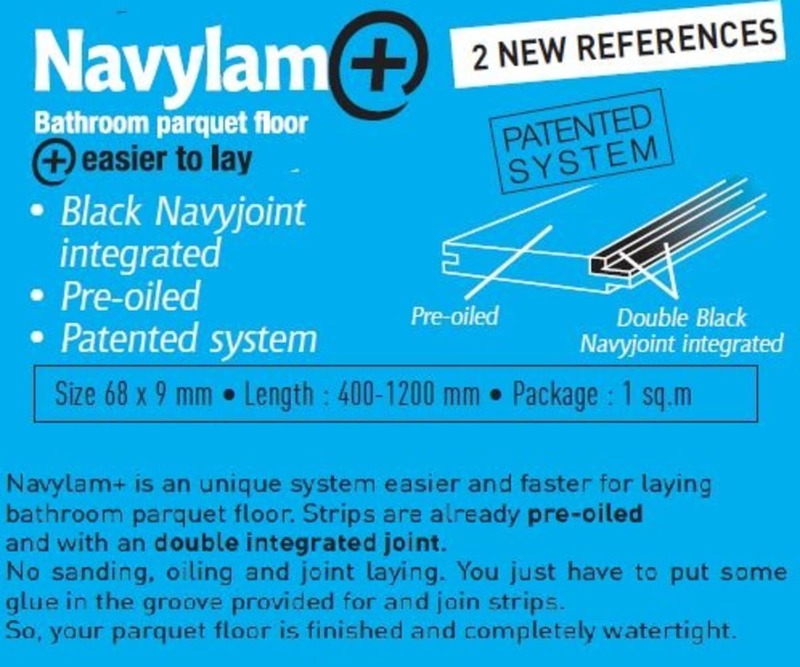 Such is the confidence of the Navylam+ Parquet bathroom wood flooring that Maples & Birch guarantees Navylam+ for use in bathrooms when the ‘Navylam+ Installation Kit’ is purchased and is used/applied during install. Begin the laying of your bathroom parquet flooring, do not forget to let some place around 5mm all around your room to do the expansion joint. For the first line, the groove is on the wall side and the tongue facing your. Now that the first line is laying, you have to stick the tongue facing you. now that the first line is laying, you have to stick the tongue with the Navycol+ and also in the end of the blade. If the glue overflows on the wood flooring, clean it immediatly. Continue to lay with the same process. The next step is the expansion joint. 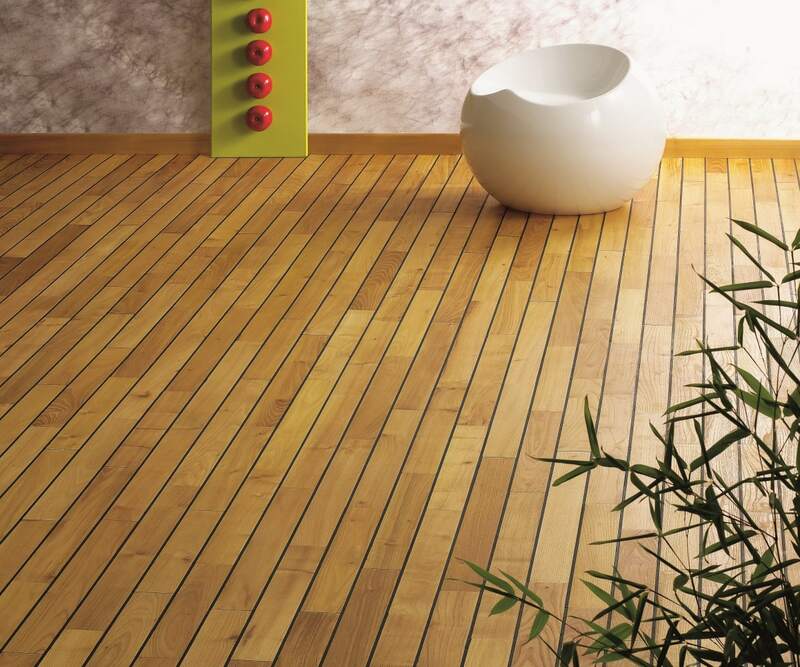 Before you begin, protect your parquet flooring in sticking an adhesive all around your room, in peripheral. Run the Navyjoint and smooth it with a spatula. Remove the adhesive and let dry. Finishing: After laying, clean the wood flooring with a floorcloth, a little wet. 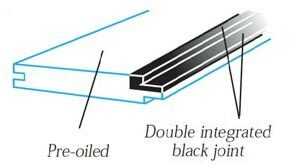 Then apply with a rag one or two thin coats of oil (Navyhulle), it is the same oil that is used for matenance. Do not let the oil on the joint. Navylam+ flooring can be cleaned easily. To renovate your bathroom wood flooring Navylam+ we advise to use the spray Navyhuile (avalible from MaplesandBirch) and wipe with a clean moist cloth. 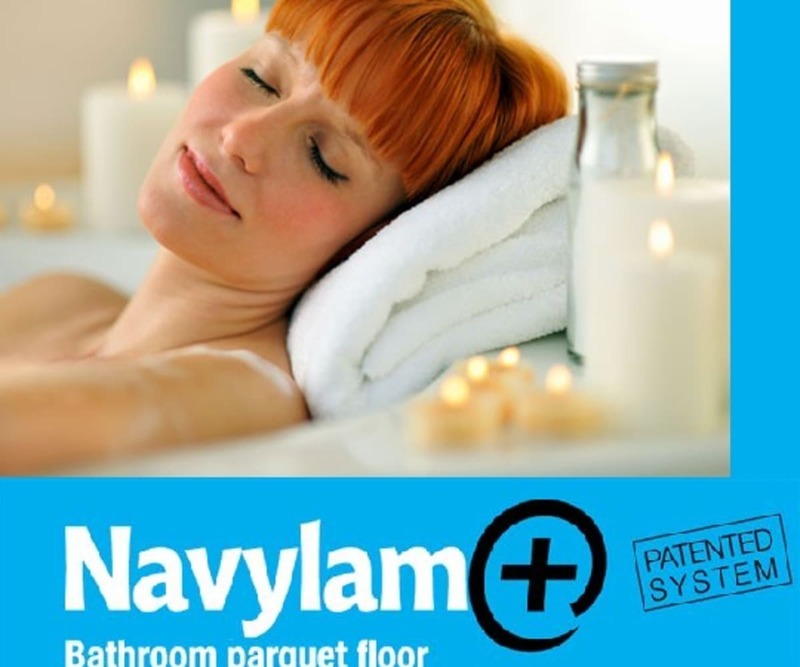 There are also a number of other matinence and installation products avaliable specifically designed for Navylan+ Flooring in our Bathroom Flooring Accessories category.